Victoria II: A House Divided :The first expansion to Victoria 2 focuses on American Civil War era and enhances the political and economical aspects of the game. Victoria II: A House Divided - American Civil War Spritepack :Carefully guide your nation from the era of absolute monarchies in the early 19th century, through expansion and colonization, to finally become a truly great power by the dawn of the 20th century. Enhance your Victoria II and A House Divided experience with the American Civil War Spritepack. Victoria II: German Unit Pack :The Victoria II: German Unit Pack adds updated uniforms and units for German soldiers. This includes units and uniforms for the German Empire, North German Federation, South German Federation and Prussia. Victoria II: Heart of Darkness :Victoria II: Heart of Darkness is the second expansion for the grand strategy and political simulator Victoria II. Victoria II: Interwar Engineer Unit: From 1919 and forward, twelve countries will receive new, unique and historically accurate uniforms. Besides enhancing the visual appeal of your armies, it will also help you identify which of your armies have the important engineer units very quickly. Victoria II: Interwar Planes Sprite Pack: Twelve different countries will, after 1918, be able to receive new, unique and historically accurate uniforms. Besides adding to the visual appeal of your armies, it will also help you quickly identify which of your armies have the reconnaissance capabilities. Victoria II: Interwar Spritepack: This spritepack adds updated uniforms for the interwar period between WW1 and WW2. From 1919 and forward, 12 countries are able to receive new unique historically correct uniforms. 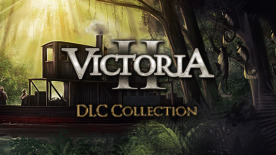 Victoria II: Songs of the Civil War Victoria II: Songs of the Civil War DLC adds nine minutes of music to enhance the atmosphere of Victoria II.